Traditio Iuris Romani is an imprint partnered with Roman Legal Tradition. It publishes works that fall within the subject matter of the journal: the civilian tradition in ancient, medieval, and modern civil law. It aims to make works available at a modest cost. Enquiries to: Prof Ernest Metzger, The University of Glasgow School of Law, Glasgow G12 8QQ, United Kingdom. 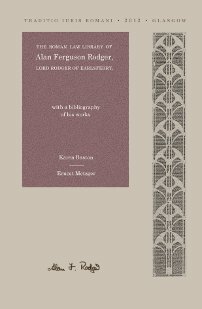 Alan Rodger, Lord Rodger of Earlsferry (1944–2011), Justice of the Supreme Court of the United Kingdom, assembled one of the largest private collections of Roman law works in the world: more than 1,300 treatises, monographs, texts and references works. This volume contains a catalogue of every work, annotated with provenance details, biographical notes on previous owners, and comments by Lord Rodger. This volume also contains a bibliography of Lord Rodger’s publications, and essays on his life and work. 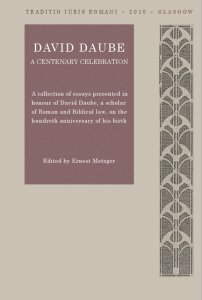 The essays in this volume were presented in honour of David Daube, a scholar of Roman and biblical law, on the hundredth anniversary of his birth. DAVID CAREY MILLER relates the events leading up to the centenary celebration. HECTOR L. MACQUEEN describes the decades-long friendship between Daube and T. B. Smith, professor in Aberdeen and Edinburgh. ROBERT A. SEGAL analyses Daube's defence of causation in biblical law as 'sophisticated' rather than 'primitive'. CALUM CARMICHAEL discusses the ritual of the red heifer in Numbers 19 and its relation to Jacob's 'red, red dish'. BERNARD JACKSON discusses the parable of the prodigal son, the legal ambiguities that attend the arrival of the returning son, and the significance of these ambiguities, especially to the relationship between historic Israel and the new church. WILLIAM M. GORDON recalls his time as an undergraduate attending Daube's classes in Roman law. ERNEST METZGER discusses Daube's lectures on the Roman law of sale, preserved in typescript. ALAN WATSON recalls his time as Daube's doctoral student, and later as his colleague. JONATHAN M. DAUBE gives a lively and personal account of his father.